While many of you are completing the 2010 Census form, I am wondering how many Indians lived in Pennsylvania prior to European contact and how many lived here 10,000 years ago. Our blog this week touches on why determining population density during prehistoric times is important and how methods are used to achieve this objective. As we all know, the goal of archaeology is to understand past cultural behavior – how people lived, how they organized themselves, their religious beliefs – and why their culture changed. We all agree that the environment can cause culture change and that it has affected cultural development. Obviously, climate (only one aspect of the environment) will affect the foods people eat and the types of food they can grow. Long term changes in climate, the end of the Ice Age, for example, had significant affects on the development of culture. Technology and invention, such as the use and control of fire, the invention of the wheel, agriculture, or metal tools also had a significant affect on the lives of ancient people. Neighboring cultures also had their effects on others. For example, in the Upper Ohio Valley of western Pennsylvania, maize was being used nearly a thousand years prior to its use in the Delaware Valley. This is a complex issue, but part of the reason is that the cultures in the Upper Ohio were closely tied to the Mississippi Valley where the use of maize dates to at least 3000 years ago. Population density is a fourth factor that some archaeologists consider to be very important in affecting the development of culture. But, unlike the environment, technology and the diffusion of ideas from other cultures, it is very difficult to trace. Some archaeologists argue that population density has had a very significant bearing on cultural developments and I would state that growing population density was the single most significant factor in affecting prehistoric cultures in Pennsylvania over the past 5000 years. On the other hand, many would argue that a combination of environmental and technological factors were of equal or greater importance. For example, the adoption of agriculture by the Indians of the Susquehanna Valley resulted in large settled villages, a tribal social organization and widespread warfare. I would say that an increasing population before the introduction of agriculture required Indians to adopt farming to feed their families. Over time, hunting and gathering simply could not support large numbers of people. There is good evidence that shows farming requires more labor intensive effort than hunting and gathering of wild foods. Assuming that people are basically lazy, they are not going to take on a new technology unless it is in some way, advantageous to do so. To prove that population growth is a prime cause in cultural development, we must be able to demonstrate that population density is increasing to a critical point prior to technological development . And herein lies the problem. How do we determine absolute population size or even relative population density prior to written records? Within a hundred years of their arrival Europeans were describing Indian villages and estimating the numbers of people they contained. Archaeologists have taken these numbers and applied them to prehistoric villages, specifically to the number of people per household which allows for hypothesizing population estimates for the period of time just prior to European contact. But what do we do for the period before the time people lived in relatively permanent hamlets and villages? How do we determine the number of people living in a nomadic hunting and gathering camp? In Pennsylvania 2000 years ago, there are very few examples of houses that have survived the ravages of time so it is impossible to extend this method very far into the distant past. Another method that archaeologists use to reconstruct prehistoric demographics is to count the number of archaeological sites per time period. Sites can be roughly dated in time based on projectile point types and pottery types. Below is a graph using this method. This graph illustrates an initial sharp population increase about 9000 years ago as the deciduous forest moves into Pennsylvania, followed by 4000 years of steady growth. At this time the rate begins to advance more rapidly. Between 1000 and 2000 years ago there seems to be a sharp population decline, however, most archaeologists believe this is not real. There are not many distinctive projectile point or pottery types for this time period (the Middle Woodland) so these numbers are artificially low. After this time, however, there is a very sharp rise in population during the Late Woodland Period when agriculture was developing across much of Pennsylvania. The graph needs to be broken into finer time periods but clearly there is evidence for a population increase prior to the adoption of agriculture. Many, if not most archaeologists, do not accept this method as a valid procedure for documenting population change. We know that some projectile point types cover a very broad time range and some types crosscut other time periods. An example of this typological crosscutting is the triangular projectile point type. It is typically associated with the Late Woodland Period where such objects were used as arrow points. However, triangular forms were also used during the Late Archaic Period as atlatl dart points and there does not seem to be any way to determine the difference between these and their latter counterparts. Therefore, the Late Archaic numbers are likely too low and the Late Woodland numbers are likely too high. Population density is clearly an important variable in the equation of determining cultural change. However, until archaeologists develop better methods for determining prehistoric population size density, the affects of this variable will largely remain speculative. 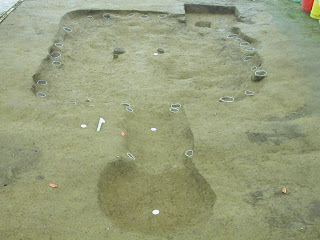 This week’s guest blog is courtesy of Deron Sharp, currently interning with the State Museum’s Section of Archaeology. A senior at Elizabethtown College, Deron is a dual history and anthropology/sociology major and is considering pursuing a career in the field of archaeology upon graduation. During the first half of my semester long internship in the Archaeology Lab of the Pennsylvania State Museum, I have been blessed with a phenomenal group of mentors to learn from. This group of people, who’s careers are dedicated to the preservation of history and the study and practice of archaeology, have emphasized the importance of developing questions while researching and maintaining the Museum’s vast collection of over four million artifacts. One of the major questions that continues to emerge numerous times throughout my experience here pertains to education. I learn more, not only about archaeology and museum collections, but about culture and history in my few months here, than I did in my early years as a middle school and high school student. Why is this? Also, what can be done to place these opportunities in the hands of younger students? I do not have any answers to these questions. However, a run-threw of what an archaeology lab assistant or technician does may help others come to an answer. The first weeks of my internship here have been extremely educational and exciting! The project I embarked on was a Cultural Resource Management collection prepared by the Louis Berger Group, Inc. for the U.S. Department of Justice Federal Bureau of Prisons. This collection was donated to the Museum by the U.S Department of Justice. As a lab assistant, the project was to audit, accession, and shelve the collection. The artifacts were excavated from a phase one archaeological survey of a proposed U.S penitentiary site in Canaan Township, Wayne County. One of my favorite things about auditing collections is the vast amount of background research that is done on the area being excavated. The site report includes the landscape of the site, which in this case is labeled as open fields with streams to the south and east. Also included in the site report is the history of the land. The particular site had a railroad grade and farm complex, along with residential housing. None of these were present at the time of excavations, with only small remains of the railroad grade. The audit can be a time consuming process, but also the most interesting and fun! Because every artifact needs to be accounted for, this process can take weeks. However, the artifacts themselves open windows to different cultures and time periods. It is fascinating to handle flakes thousands of years old, observe the many different types of historical nails, compare the different sizes of glass and determine their uses, or admire the pottery and wares of a time period! The lab assistants here have a remarkable eye for detail and because all of these items have to be counted and stored, an unbelievable level of organization. The accession process was as simple as handing the audited inventory to the Registrar’s Office. Also, shelving was not much different then the final scene of Indiana Jones: Raiders of the Lost Arc, with the exception of technologically advanced condensed storing units, controlled humidity and temperature, and a vast storage database. Each artifact raised numerous questions in my head, and I would love to thank the team for putting up with, and helping to answering them. Through this process, I was able to dig deep into an era of history, this so happened to be the late 1800’s to early 1900’s, and acquire an understanding for the way of life in which these people lived. I learned so much in such a short amount of time, that I began to wonder why I am only now being exposed to this type of learning. Answering the questions I mentioned earlier will take some time, if they can be answered. However, as a student in both the educational and museum worlds, I can see a huge benefit for students who spend time with the opportunities of learning a museum provides. I would suggest that some serious thought be given to help merge these two worlds in order to better educate tomorrow’s future. *Thank you to the six individuals who make this blog possible; who alone manage, collect, and maintain the over four million and counting artifacts. We have been blogging for the past year about some of the interesting artifacts that we curate at The State Museum, but we have never discussed the core functions of our department in one blog. Most of you are aware of our public outreach programs and might have visited with us at the Pennsylvania Farm Show or Fort Hunter. We may have spoken to one of your school groups or to a Chapter of the Society of Pennsylvania Archaeology. If you contacted us about a possible Native American artifact, we tried our best to help you identify your artifact. Perhaps you visited us at the State Capital for Archaeology Month, if we haven’t met you keep watching for us as you never know where we will be next. Our other main venue for public outreach is the Anthropology and Archaeology Gallery of The State Museum of Pennsylvania. Our Section is responsible for maintaining the exhibits in the Hall of Anthropology & Archaeology. This entails exhibit labels, lighting, and design components for the over 2300 artifacts on display. Recent improvements to the Gallery included the addition of two mannequins in our Delaware Indian Village, improvements to the color and design of our Ethnographic exhibit and replacement of costly fluorescent lighting to energy efficient LED lighting. Pending funding under the latest state budget is a new exhibit on the archaeological investigations at Fort Hunter and upgrades to the Delaware Indian Village. This Sunday, March 14th is Charter Day and the State Museum admission will be free. Stop in and view the original Charter of the Commonwealth of Pennsylvania and check us out in the Anthropology & Archaeology Gallery on the 2nd floor of the museum. Another primary function of the Section is as the State Repository for Archaeological Collections recovered from Cultural Resource Management (CRM) Projects. CRM Projects are collections produced as the result of state and federally funded projects in which archaeological investigations are deemed necessary by the Bureau for Historic Preservation. These collections are available for academic and professional research, loans to approved non-profit institutions, and for educational presentations. The landowners of these collections have generously donated artifacts excavated on their property for these research and educational venues. Archaeological firms from throughout the United States conduct the necessary investigations to insure that evidence of past human behavior can be either preserved or salvaged prior to development. Submission of donated collections requires the archaeological firms to prepare collections to Curation Guidelines prepared by the Section. This process involves the organization of artifacts, cleaning and labeling appropriate objects with catalog numbers, and housing artifacts in acid-free containers. Reports generated by the contract firms along with their field notes, maps and photo documentation are organized and curated as well. These records are often more important than the artifacts in helping us to understand the archaeology of a site. This organizational process is essential for the archaeology community to conduct further research and recreate the site excavations. Archaeological investigations provide us with tangible evidence to our past and often help to answer questions about our cultural heritage. The benefits of having artifacts, over four million, curated in temperature and humidity controlled environments, in a centralized location, is priceless for researchers both today and for posterity. Many times artifacts not properly curated are allowed to sit in storage facilities making them inaccessible to researchers and exposing them to infestation from insects, rodents and molds. Unfortunately there are numerous curation facilities throughout the country that are unable to maintain staffing and have exhausted the available space for archaeological collections, preventing access to the collections for further research. Collections from avocational archaeologists and collectors are another essential component of our facility. We focused on some of these folks during the month of December during our “month of giving”. These collections are often from sites that have been destroyed by development or contain unusual artifacts collected throughout several generations. The documentation and records associated with these collections are especially important in helping us glean information about past human behavior. These donors recognize that although they have treasured these artifacts, it is better to keep the collection together than to allow them to be sold at auction or over the internet. Family members sometimes do not realize the importance of the documentation or the artifacts associated with these private collections and may discard critical provenience information, undoing years of work by the collector. We clean and catalog these artifacts and documents, and rehousing them in acid- free materials insuring their availability for generations to come. We also participate in the annual conferences of The Society for Pennsylvania Archaeology, The Society for American Archaeology and The Mid-Atlantic Archaeological Conference all of which will occur over the next month or so. Presentations based on research of excavations at Fort Hunter, analysis of documentation and artifacts from Works Progress Administration sites excavated in the 1930’s and analysis of the Flint Run Paleoindian Complex sites in Virginia. Additional papers will be presented at these conferences based on research conducted on collections housed at The State Museum by professionals and students. These conferences are an excellent opportunity to hear fascinating reports on current research in anthropology and archaeology. The motivation for us in this profession is the enthusiasm demonstrated by the public when they are able to learn about the past through archaeology. Bridging the past is often possible through an artifact as that is the physical evidence, but understanding the story of the people who made and used the artifact is the deeper link to our past. We strive to deliver this message to everyone we encounter and hope that our readers benefit from our passion for research, collections, exhibits and outreach as we continue to learn and share our common heritage. It’s official! 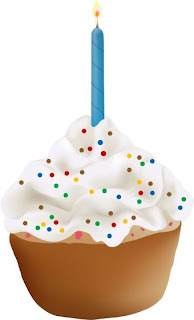 Our TWIPA blog has reached its one year anniversary. Once a week without fail over the past year we’ve posted short essays across a broad range of topics within the field of archaeology, and hopefully our readers have found them to be informative and even entertaining. 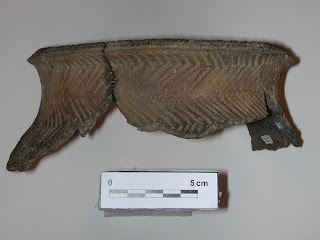 From paleo-indian scrapers to a 1908 PA license plate and a little bit of everything in between, it’s been an enjoyable experience to share notable artifacts and current archaeological events with the public via the web. This week, we thought we’d take a moment to extend our appreciation to everyone who has in one way or another contributed to TWIPA over the past year. You know who you are, and we think you’re awesome. Also, a big thanks must go to our readers. You are the driving motivation behind our efforts, so keep those comments coming. If there's a topic you'd like to see TWIPA cover, let us know. Stop back next week, as we continue to explore and expose the wide world that is Pennsylvania Archaeology.